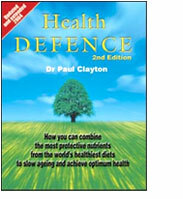 In addition to scientific articles (see CV above), Dr Paul Clayton has written three books. Health Defence, in its 2nd edition, draws lessons from the world’s healthiest diets to define the ideal protective diet and supplement. It spells out which foods can significantly reduce your risk of diabetes, stroke, heart disease and Alzheimer’s, and shows why so few Japanese women get breast cancer and so few Japanese men get prostate cancer. It is probably the definitive book on how optimum nutrition can cut the risk of degenerative disease – and how you can incorporate the most protective nutrients from the world’s healthiest diets into your own everyday diet. After Atkins is Dr Clayton’s examination of why the average person is getting fatter, yet simultaneously his or her nutritional status is declining. He gives easy-to-follow advice on how to lose weight on a sustainable basis – and at the same time improve your energy levels and life chances. I’d like to buy this now.